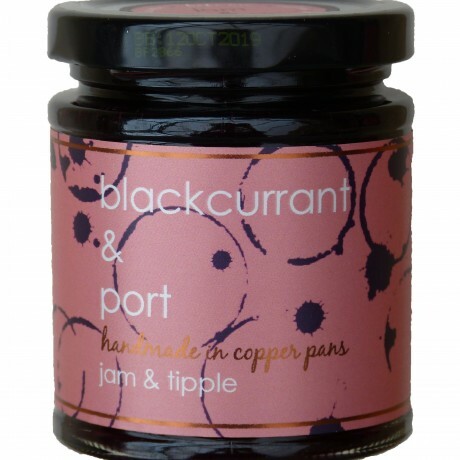 Made to a traditional recipe, deep purple blackcurrants are lovingly hand prepared and cooked in copper pans. Bringing you delicious flavour, for further enjoyment and a little sparkle, a modest slug of port is stirred in. One of the most luxurious jams prefect for Christmas. Try glazing meats and game with this delicious jam or even with artisan bread for a midday treat.. Available to buy in a quantity of three jars or you can swap jars two and three for any of the other jams. Sugar, strawberries (45%), champagne, marc de champagne, pectin, citric acid. Prepared with 45 g fruit per 100 g. Total sugar content: 67 g per 100 g.
Gourmet artisan jams laced with tipple.